When some people think of Cooperstown, baseball immediately comes to mind because of the large number of related attractions including the Baseball Hall of Fame and Museum, Doubleday Field and a proliferation of game-specific shops in the community. As baseball is not high on my list of priorities, my thoughts of Cooperstown conjure up scenarios from James Fenimore Cooper's writing that include The Deerslayer, The Pioneers and Wyndotte. His daughter Susan's interesting book Rural Hours did its part to finally persuade us to visit the area. Once there, we quickly found out that there is far more than baseball happening in the pretty New York state village. 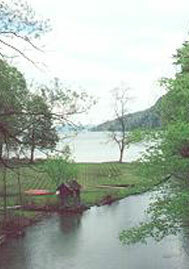 Cooperstown, surrounded by gentle old mountains, lies at the southern end of Otsego Lake. The Lake, known in James Fenimore Cooper's novels as Glimmerglass, is a nine mile, spring-fed beauty, surrounded by the gentle hills of the Leatherstocking region of eastern New York State. The prolific writer's roots are entwined with the history of Cooperstown. James grew up in Otsego Hall, home of his father William, founder of the village. Ideas for his books came from hours of wandering hill, shore and lake. After marrying, James lived on a farm that stood on the grounds of Fenimore Art Museum. He left the village but returned for good in 1839 and spent his last years at Otsego Hall. Otsego Lake and shore has a long association with Aboriginal peoples being part of the lands that belonged to the Iroquois confederacy. Council Rock is located in the village at the south end of the lake where the Susquehanna River begins its long journey toward the sea. The Rock was an important tribal meeting place. After bones and artifacts were dug up during some landscape work nearby, beside an odd looking hill, it was determined that the raised area was an Indian Burial Mound. The bones and artifacts were reburied and properly marked, both at the road and mound. The mound epitaph is particularly poignant. Rev W.W. Lord wrote - White man. Greeting! We near whose bones you stand were Iroquois. The wide land which now is yours was ours. Friendly hands have given back to us, enough for a tomb. A tour around the lake reveals many pleasant surprises including the haunts of Cooper's fictional Hawkeye and Natty Bumpo the Deerslayer. We found Leatherstocking Falls, Glimmer Cave, Mohican Point, Natty's Cover and Muskrat Castle. 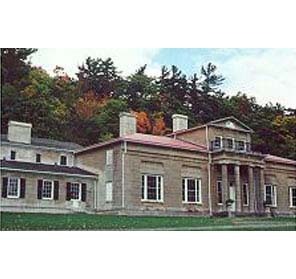 Cooperstown is an ideal headquarters for the New York State Historical Association. For total immersion in local history, the Farmer's Museum, a five minute drive from Main Street, is the place to visit. With its restored buildings and in-theme displays , the complex is a good recreation of a 19th century village, complete with costumed staff, lots of hands-on activities and special events. Across the road Fenimore Art Museum holds a marvelous collection of more than 80,000 pieces of American folk, fine and decorative art. Not all are on display at the same time of course. The Cooper Room, a permanent exhibit, is devoted to the writer and houses furniture, portraits and family memorabilia. The complex is also home to the Eugene and Clare Thaw Collection that contains more that 750 pieces relating to Aboriginal history. Rotating exhibits of the Thaw collection are mounted in the American Indian Wing. Did you know that the hide wrapped around the lower body of the Plains Indians was called a kilt? And that Indians in Quebec and some parts of Ontario wore a highly beaded hat called a Glengarry? Excellent examples of both items were on display during our visit. The Fenimore Art Museum Gift Shop is the place to buy reprints of both James and Susan Fenimore Cooper's fictional and non-fictional writings. Approximately eight miles north of Cooperstown, the Alice Busch Opera Theater is home each summer to Glimmerglass Opera. On nice evenings the sides of the Opera House are pulled back during intermission to let cool lake breezes flow through the hall. Circle the north end of the lake by taking Highway #53, or Highway #20 to #31. 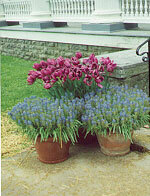 Watch for signs to Hyde Hall which has been called one of the great buildings of its time in America. Hyde Hall was the brainchild of George Clarke who wanted a grand house in the tradition of an England Manor. The house, begun in 1817 and finished-but not quite-in1834, is majestic in scale and design. Its fifty rooms evolved from stone cottage to additions of huge kitchen and servant's wing then Great House with large Public Rooms, surrounding an open, paved courtyard. Hyde Hall is a work-in-progress. Layer upon layer of history is revealed as sympathetic restoration continues. Be careful driving into Hyde Hall. The area's deer population love to stand in the middle of the road when they are not grazing in ditches and fields close by. 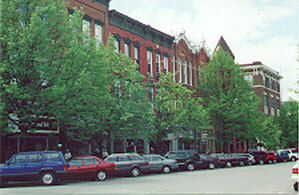 Historic Cooperstown has a compact retail area with most shops, restaurants and other services on Chestnut, Main and Pioneer Streets. As the village's main area does not include a state road or highway, tree-lined avenues are a reminder that the charm of small town America still exists. Lakefront Park two blocks from Main Street, has a magnificent view of the lake, especially at early dawn when mists rise from cool waters. 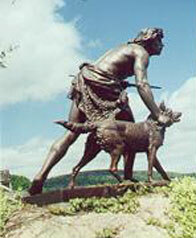 The park is home to a John Quincy Adams Ward statue entitled Indian Hunter & His Dog. The original is in Central Park, New York City. Due to the popularity of the village parking can be a hassle during peak tourism seasons. There are large free parking lots at the edge of town with reasonably priced trolley service to the main area. 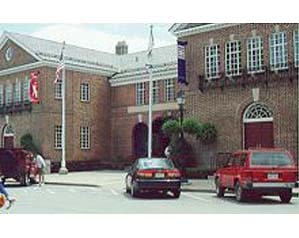 The National Baseball Hall of Fame Museum is the ultimate dream destination for every fan of the game as are the ever increasing number of retail shops catering to devoted fans. There are some great specialty shops and one-of-a-kind boutiques for those less interested in baseball memorabilia. Cooperstown is one of the most architecturally intact villages in New York State. Pick up a self-guided, walking tour pamphlet at the Chamber of Commerce and enjoy viewing some superb examples of late eighteenth and early nineteenth century residential and retail architecture. In particular the c1804 Pomeroy Place has an intriguing herringbone pattern in walls constructed by local stone mason, Jamie Allan. C1873 Greencrest on River Street is reputed to be haunted by two ghosts, a young wife in the house and an Indian Chief whose grave is said to be near a stone wall on the property. It is best to visit Cooperstown during the week in late spring or early autumn. Less people means more time to thoroughly enjoy its many attractions and amenities. With its tree-lined streets, gorgeous flower boxes, great architecture, beautiful lake and exceptional heritage-oriented attractions, the village and area deserve at least three days of your time. Cooperstown has green space around it that separates and protects the historic village from rampant commercial development. But if you are approaching from the south, you will notice that the area is not without the usual malling and stripping one comes to expect near any worthwhile attraction. We approached from the north and were completely unaware of the sprawl during our three days in the village. Way to go Cooperstown! There are lots of accommodation choices near and in Cooperstown. We recommend two in particular, the Inn at Cooperstown and Hickory Grove Motor Inn. The c1874 Inn at Cooperstown is an excellent example of Second Empire architecture. Situated in the heart of the village's historic area, it is a quick walk to the Lake and Main Street. The farmer's Museum and Fenimore Art Museum are five minutes away by car. 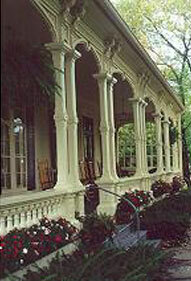 The Inn operates as a Bed and Breakfast facility but restaurants are close-by. 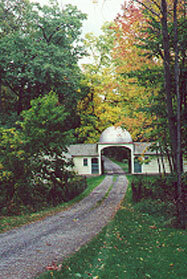 Hickory Grove Motor Inn on Rte #80 is approximately three miles north of Cooperstown. It is a clean-as-a-whip, family-run accommodation with tantalizing views of Otsego Lake from each room. There is no restaurant at Hickory Grove. A continental breakfast is served sprint and autumn guests. Friends of Hyde Hall Inc.